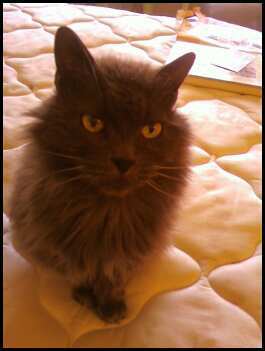 Sept. 25, 2011: My cat Cinder died Friday night. Although Cinder had been sick – throwing up – the day before, I most certainly wasn’t expecting her to pass away that night, so it definitely was a shock, as I had planned to take her to the vet Sat. am if she wasn’t better. I have lost pets before – my dog Sammy several years ago, and another beloved cat Morgan more than 10 years ago. However, I have never had a pet pass away at home, and I have to say it only adds to the trauma. It was so very difficult to pick up her lifeless body and transport her to the vet. I was so distraught I thought I might throw up. Cinder was with me for about 12 years, and this post is dedicated to her. When I got Cinder, I had one cat Jenni, who had recently trekked across the country with me on our move back to Colorado from DC. I had just moved into a new apartment and was traveling a fair bit with my job. I thought Jenni might enjoy having a companion when I was gone. I decided to adopt another kitty cat. I went to a few animal shelters, including a cat-only shelter, which was literally crawling with the cats. They were everywhere, some in pens, some just wandering about. Cinder, who at the time was named Eclipse because there was an eclipse the day she was brought to the shelter, was sitting underneath a bench. I picked her up and she immediately began purring loudly, and we bonded right then and there. However, her transition into life with Jenni and me was a bit rocky. Cinder hid under the bed and only came out to use the litter box and drink some water. She refused to eat any kind of food. Jenni wasn’t much help and was rather standoffish and aloof toward Cinder (hence her nickname Queen Jenni! ), apparently not at all excited about having a new pal. One day I came home from the grocery store and found Cinder in the kitchen lapping up some water. A plastic grocery bag fell to the floor, and Cinder began licking it. It occurred to me that maybe before finding her way to the shelter, Cinder was a street kitty dining out of garbage bags. So I stuck some cat food into a bag, and voilà – she at it! I gradually did wean her off dining ala alley cat style, and she eventually she ate like a regular indoor cat! Over the years, Jenni and Cinder never became best buds, but grew to tolerate each other, and hopefully it was nice to at least have another warm body in the house when I was traveling! Queen Jenni occasionally delighted in tormenting Cinder, by sneaking up and pouncing on her, which was met with a loud, indignant hiss from Cinder! When I bought my first house in 2001, I decided to get a dog. One of my friends joined me at an animal shelter, and I adopted my dog Sammy (named by my friend at the shelter!) Neither Jenni or Cinder gave Sammy a warm welcome to our home greeting. Queen Jenni was of course rather haughty toward Sammy, taking swipes at Sammy every time Sammy went outside. In turn, Cinder was afraid of Sammy, scurrying out her way if she came to near. But eventually everyone learned to get along – more or less – and we settled into a routine. Fly the Friendly Skies: One of my favorite Cinder stories occurred when I moved from Colorado to Wisconsin for a new job. After several days of non-stop, harried packing, I was ready to load up the car with a few belongings and start the long drive to WI. My dog Sammy had passed away a couple of years earlier, so it was just me and the two kit cats making the journey. I got Jenni into the pet carrier, but Cinder simply refused to get in hers. I decided to leave Cinder behind and deal with her when I flew back to meet the movers. I had never flown with a pet before, and since Cinder had never traveled anywhere long distance, much less on a plane, I viewed the trip with trepidation. I had a serious talk with Cinder and tried to give her an idea of what to expect. The day of the trip, I took a deep breath and we drove to drop off the rental car – all the way not even one meow from Cinder. Then on to the shuttle bus – again not one peep! We checked in and got in the security line. I envisioned Cinder jumping out of my arms, and me racing after her and getting arrested for breaching security! Then to the gate and boarding. Again, not one single meow from Cinder. In fact, she didn’t make a sound during the ENTIRE trip – from start to finish. It still amazes me to this day how calm the sometimes skittish Cinder was. So it’s cathartic a few short days after Cinder’s passing to think about what a great companion she was and smile about the memories. Some of you may scoff, but I do believe pets go to heaven, and that Cinder is having some new adventures with Sammy and all our other beloved pets. This entry was posted in job hunting, unemployment and tagged cats, losing a pet, pets, writing. Bookmark the permalink. I’m so sorry for your loss. Despite what many think, I know our animals do have souls and are caring creatures that bond with us. Some years back, my 18 year old cat died, and then my dad died almost exactly a year later. Both had been ill for some time. It’s weird and odd, but I just cried and cried more over my kitty. It’s not that I loved or cared for my dad any less or anything (and dad loved that kitty too by the way) but there is just something about an animal that is so completely dependent on you for everything that totally breaks your heart. Thanks you for your kind comments. Losing a pet versus a person is a very different thing. The bottom line is they are both very hard to endure! I’m just catching up with your blog and really sorry to hear about Cinder. As I’m sure you realise I would be bereft without Chaplin. With cats I think we can take comfort in knowing we looked after them well, spoilt them rotten and served them as they expect humans to! I’m sure she had great nine lives! Thank you for your kind words. I dearly miss my sweet little Cinder, and my heart is very sad. But she did have an extremely good life! And I love your reading about your Chaplin! !